Can’t copy, write, edit or delete files on Linux-formatted drives on your Mac? It’s simply because macOS doesn’t support Linux drives at all, not even in the read-only mode. extFS for Mac by Paragon Software provides fast and unlimited read/write access to ext2, ext3 and ext4 formatted drives intended for Linux systems! Write Access When a volume is mounted in write mode, you can do everything with the files and folders it contains: read, edit, delete, rename, create new. Automount extFS for Mac by Paragon Software mounts supported volumes automatically at startup, so you don’t need to worry each time you restart the operating system or power your computer on. However, this feature can be disabled at any time in the program interface. 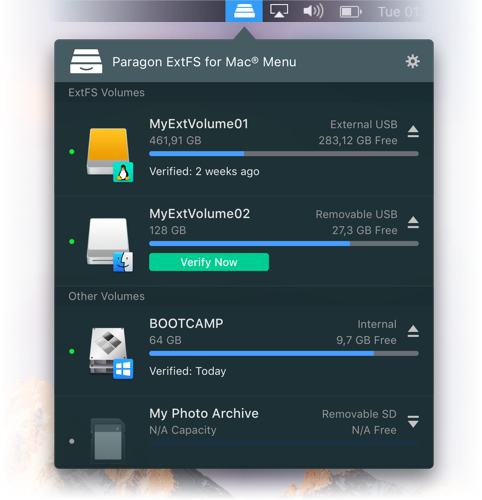 Volume Management extFS for Mac by Paragon Software easily formats, checks integrity and repairs corrupted volumes. Internationalization extFS for Mac by Paragon Software supports all alphabets supported by your operating systems, including those that use non-Roman and non-Latin characters, so you will never face the problem of not getting access to file names on volumes mounted in non-native OS. Read/write support for LVM (Logical Volume Management) With extFS for Mac by Paragon Software, your Linux’s logical volume manager won’t lose any of its functions. It will be able to perform open, close, read and write operations and, in general, operate as usual. Compatible with 3rd party software extFS for Mac by Paragon Software is compatible with popular virtualization and encryption applications including VMware Fusion and Workstation, Parallels Desktop, TrueCrypt and its forks. Support for latest extFS features The majority of ext4, the latest file system format of Linux, features are now supported: 64bit, dir_index, extent, extra_isize, ext_attr, flex_bg, has_journal etc. Please, note that extFS for Mac by Paragon Software currently does not support bigalloc, journal_dev, meta_bg features, metadata_csum, inline_data.